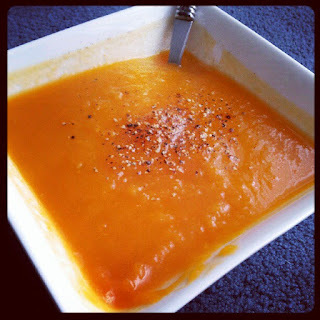 I love soups in winter and one of my favourites is pumpkin. The pumpkin soup I make is not overly 'pumpkiny' and even my sister who doesn't like pumpkin eats it. This winter, to help ward off colds I decided to add a few new ingredients to it. I often make it in big batches then freeze some flat in ziploc bags. It is easy to defrost if frozen flat and helps stop us ducking down to the shops to get takeaway when I can't be bothered cooking. Place everything in a saucepan, bring to the boil and simmer for 20 minutes until all the vegetables are soft. Blend and serve. It is super easy, but really yummy. The more potato/kumara in the soup the thicker it is. You can add more stock if you prefer a thinner soup. I love to serve it with cream and freshly cracked pepper.